From late 1942, RAF Duxford - the famous Battle of Britain airfield - began to receive aircraft and personnel from the 78th Fighter Group of the United States Army Air Force as part of the so-called "friendly invasion" of Great Britain. 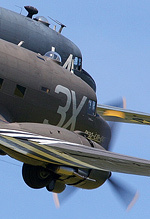 In April 1943, RAF Duxford was officially handed over the Americans and became Base 357. The 78th Fighter Group flew its first combat mission on 13 April that year, whilst they were operating P-47 Thunderbolts. 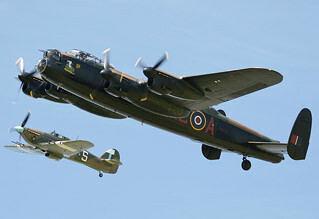 70 years later the Duxford Spring Air Show commemorated the "Mighty Eighth". Stuart Norris reports on the Imperial War Museum's season opener. 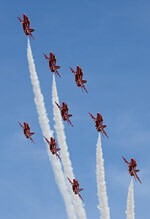 Additional photography UK Airshow Review Team. 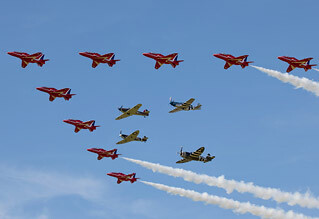 The build-up to the show focused heavily on the "Eagle Squadron", a display team formed especially for the show flying four famous World War Two fighters. On paper, the idea seemed quite simple; take four renowned warbird display pilots and get them to fly in formation, but having gone to great lengths to assemble the aircraft, could the Eagle Squadron live up to the pre-show expectations? For me the answer was a resounding "yes". The extraordinary effort that went into putting this team together was clear for all to see. P-51C Mustang "Princess Elizabeth" was shipped to Duxford from her home in Houston, Texas. UK based Hurricane AE977 and Spitfire Ia AR213 were both repainted in new markings specifically for the Eagle Squadron, and The Fighter Collection's (TFC) P-47G Thunderbolt "Snafu" completed the set. Dan Friedkin, Ed Shipley and Steve Hinton - better known as the Bremont Horsemen - made up the spine of the team, with British pilot and former Red Bull Air Racing champion Paul Bonhomme leading the formation. 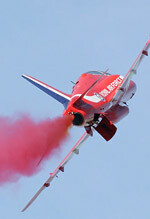 Further details can be found in our Eagle Squadron feature. While honouring the Eighth Air Force, the mix of British and American pilots in the team also reflected the special friendship between the two countries that continues to this day, as the armed forces of both nations continue to serve alongside each other in Afghanistan. Prior to the show officially starting Colonel Clarence Emil 'Bud' Anderson, a triple ace who flew with the 357th Fighter Group from RAF Leiston in Suffolk, was taken for a flight in TFC's TF-51D Mustang "Miss Velma". After his flight, Bud was driven the length of the crowdline in a Willys Jeep and the huge audience cheered and gave Bud a standing ovation to show their appreciation - one of many moving moments during the day. The Eagle Squadron opened the show with a missing man formation which in turn was the start of a minutes silence to remember the American airmen who served in the European campaign. The team then made a number of low, sweeping, tight formation passes before breaking into pairs, the Hurricane and Spitfire flying together with the Mustang and Thunderbolt making the second duo. It was an awesome sight and sound. You really need to see the Horsemen team fly to appreciate just how tight their formations are - an especially difficult skill in four machines of wildly differing performance. 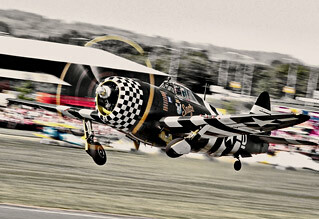 The Thunderbolt in particular made a noise unlike any other warbird as Steve Hinton really cranked up the power. The routine was concluded with a single pass in formation pass B-17G "Sally B", before the quartet of fighters peeled off to land, leaving the airfield clear for the Flying Fortress to fly her own salute. 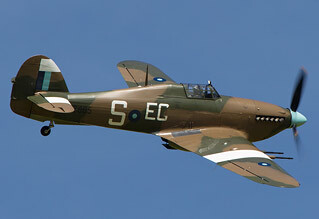 A number of display acts were chosen for their links to the Eighth Air Force and included the Curtiss two-some of P-40B Warhawk and P-40F Kittyhawk, Steaman, a pair of Harvards, Lysander, Dragon Rapide and a pair of L-4A Grasshoppers. The stand-out display was the solo routine from Pete Kynsey in "Miss Velma"; low, fast and providing plenty of the popular topside passes so revered by keen photographers. Further displays came from Richard Grace and John Romain, piloting the Grace Spitfire and Buchon respectively, an unusual solo display from the Breitling Wing Walkers, the RV8tors, the Trig team and the Battle of Britain Memorial Flight. The F-86 Sabre made a welcome return to the display circuit following engine rebuild that kept it out of action for much of 2012, while the former Delta Jets Hunter T7, now a resident at North Weald, made a display debut under new ownership. Prior to the show ending the Eagle Squadron took to the sky again, heading to Bury St Edmunds to form up with the Royal Air Force Aerobatic Team. What followed was a single formation pass over Duxford - a unique sight which may never be seen again. After a brief hold to allow the fighters to land the Red Arrows made their first full nine ship display in the UK since August 2011. Initially, despite the clear blue sky they were only performing their flat show due to air traffic control restrictions but these were soon lifted by Essex radar, allowing the team to put on their full display and close the show in some style. 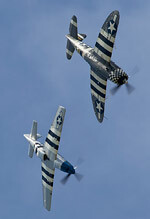 For me this was the best show at Duxford since the 2010 Battle of Britain anniversary display. There may well be bigger shows scheduled for this year, but the Imperial War Museum have already set a high benchmark at this stage.